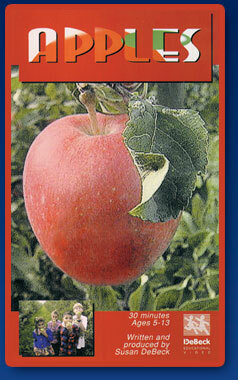 Did you know most apple trees are clones? Watch APPLES to find out why. Beginning with the important apple legend, Johnny Appleseed, APPLES goes on to explore apples in pioneer times with the story of the McIntosh apple. John McIntosh discovers a seedling near the St. Lawrence River which becomes the tree from which all Mac apples eaten today descend. Along with a tour of the root cellar, John's wife Hannah shows the use of apples in her kitchen, and makes an apple doll. An orchard is visited over the seasons from winter pruning, spring blossoms with bees and pollination, spring planting, summer thinning to fall harvesting. The harvest tour includes the stories behind the Red Delicious, Golden Delicious, and Granny Smith apples. Viewers see apple cells through an electron microscope. They learn how to grow an apple seed and clone an apple tree. Using apples to make juice, pies, and candied apples rounds out this apple picture which ends with a song, "Come to the Apple Trees". Ages 6 - 10. Reminiscent of the producer's stellar Cranberry Bounce [BKL F 1 92] this video gets under the skin of the common apple in a child-centered production that mixes history, science, math, horticulture, cooking, music, folklore, crafts, and games into a toothsome treat of fact and fun, entertainment and instruction. At a pioneer museum, reenactors explain grafting and portray the old cooking techniques for preparing and preserving apples, which are also seen being crafted into dolls. Attractive footage of orchards discloses the intricacies of propagation and then follows the seasons of an apple - pruning, pollination, planting, thinning, cultivation, and harvesting. There are side trips to a lab to learn about the structure and parts of apples and a walk among the trees where children join in the happy task of picking apples for packing, processing, and the shipping to the supermarket. A brief excerpt of Rossini's familiar William Tell overture, the cooking and enjoyment of an apple pie, and suggestions for the use of apples to celebrate Halloween and other asides that are packed into this glowing tribute. All this fascinating apple lore is presented through judicious selection, pleasing editing, and the good sense of visual appeal so that kids will drink it eagerly as they quaff the foaming juice from fresh-pressed apples.